This All-Hazard booklet was developed as a resource for citizens of rural agricultural communities –individuals, farmers and producers, businesses –with the hope of raising awareness of the natural and man-made threats to these communities and their commodities. These threats can include natural disaster situations (e.g., floods, tornadoes); biological emergencies (e.g., pandemic flu, food safety recalls) and man-made or technological threats (e.g., bio-or agro-terrorism, agrochemical situations). Sections containing National and State contacts as well as sources for additional information are also provided. 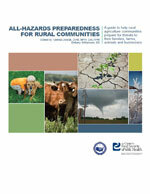 Each section contains an overview of the particular hazard and several informational handouts. The handouts are presented in a check list format to help guide individuals in rural communities in preparing for a particular hazard before it occurs, during the event, and recovering from the situation.